Art Nouveau painter and decorative artist Alfons Mucha was commissioned to design the stamp. 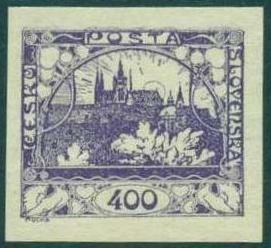 He chose the St. Vitus Cathedral at Hradcany Castle as the central element in the stamp design, seeing the landmark 14th century cathedral as having special cultural significance. Mucha embedded many additional symbolic elements in the stamps. According to an interview he gave on the subject, the leaves in the upper corners are Slavic symbols of blooming and awakening, the roosters in the lower corners are announcing the new day, the small hearts are for the love of peace, and the rising sun seen on the earlier types represents the dawn of a new day. 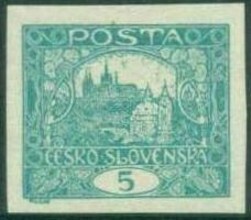 Upon taking over responsibilities for the posts, the new Czechoslovakian government engaged the firm Graficka Unie for the production of postage stamps. Neither the printing company nor the new government had experience in stamp production. Combined with this inexperience, issues with papers and inks and the need to regularly repair and replace the letterpress plates resulted in extensive variation for the alert collector. Specialists identify five basic designs types over the life of the Hradcany issue, which will be identified here as types A-E. The first series of stamps was released in batches between December 18, 1918 and January 29, 1919 as the first print runs on the various denominations 3 haleru thru 400 haleru became available. There were two distinctive types. 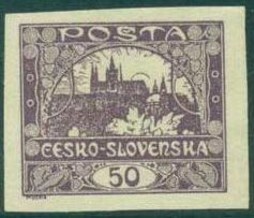 On the lower values, 3, 5, 10, 20, 25, 30 and 40 haleru, the lettering for the country inscription appears in the framing elements of stamp with the letters in white on a colored background - Type A. 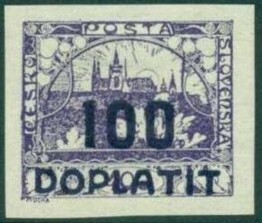 On the higher values, 100, 200 and 400 haleru, the lettering of the country inscription is colored on a white background - Type B. Type A - White letters on a colored background. Type B - Colored letters on a white background. Beginning in March 1919 postal authorities began issuing a number of stamps with new denominations, and reissuing some denominations as well. The first of these were denominated 1 haleru and 50 haleru. 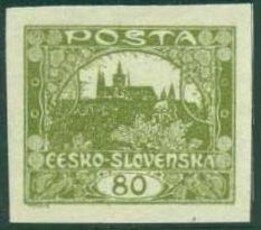 On these stamps the inscription POSTA along the top of the frame was made larger and bolder, while the country name, hyphenated as CESKO-SLOVENSKA, is moved from the vertical bars of the frame to a horizontal bar running across the stamp - Type C.
Type C - CESKO-SLOVENSKA, is moved to a horizontal bar above the stamp denomination. Between April and June 1919 four additional denominations were released - 60, 80, 300 and 1,000 haleru. On these issues the sun which had been seen rising behind the cathedral on earlier designs is gone, and the foliage in the foreground which had been white is shaded - Type D.
Type D - Rising sun removed and foliage shaded. The last of the design changes are seen on the stamps issued between June 1919 and April 1920 in denominations of 5, 10, 20, 15, 25, 30, 50, 75, 120 and 500 haleru. 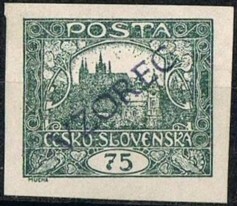 On these stamps the foliage seen in the foreground on earlier issues is now removed - Type E.
Type E - Foliage in foreground removed. Most of the stamps were printed on wove paper of various thicknesses. Shortages did result in small quantities being printed on laid and pelure paper. All denominations were issued imperforate. Some issues were also issued perforated. The official perforations were applied by Graficka Unie. There were multiple machine types in use, the result being numerous combinations of perforation types and measures. Additionally, certain private companies were given permission by the government to apply their own perforations to imperforate sheets, and local post offices applied their own rouletted perforations, resulting in even greater variety. The 10, 20 and 30 haleru values on the Type E printings were intended to be released only perforated, but some imperforate sheets were accidentally released, making these imperforate copies significantly more scarce than others in the issue. The Hradcany issue is notorious for its color varieties. There was poor quality control on the supplies of inks used, producing many distinctive shades. Also, some of the inks were unstable, resulting in what are known as changeling varieties as the colors changed over time with exposure to light, chemicals, and the environment. 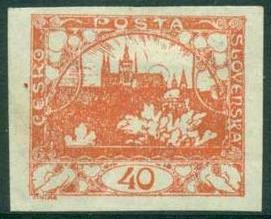 There are four types of overprints to be found on the Hradcany issue. 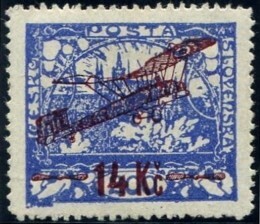 An airplane and surcharge overprint was applied to stamps for airmail use in 1920. Between 1920 and 1926, postage due stamps were created by overprinting the word "Doplatit" and a surcharge. 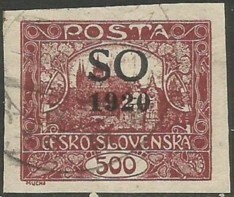 Stamps overprinted "SO 1920" were for use in Eastern Silesia, and lastly stamps with the "Vzorec" overprint are specimens. 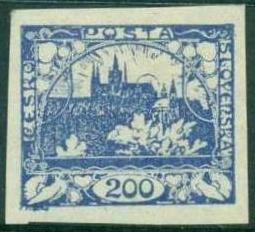 In general, the stamps of the Hradcany issue are very affordable. As with any specialized material, some of the more exotic varieties can run into the hundreds of dollars. However none of the basic varieties of the regular issue stamps are expensive, and even in mint condition a full set can be obtained on virtually any budget. Many are listed at the minimum catalogue value and they can typically be acquired for even less as part of small lots. Other than the aforementioned exotics, the airmail overprints are perhaps the only ones of the issue that might give the budget conscious collector pause, but even those are readily available and with patience can be found at an attractive price. For further research, The Society for Czechoslovak Philately, Inc. has many resources available for new and experienced collectors. For 100 years now the Swiss Post has issued semi-postal stamps and philatelic products to raise money for the Pro Juventute Foundation. The attractive topical stamps and good works of Pro Juventute combine to make these issues favorites with the Swiss public and stamp collectors around the world. The Worldwide Illustrated Stamp Identifier is a tool that helps to visually identify the country of origin of particularly challenging stamps. These stamps include those that have no country name written on them, and those where the country name is inscribed using a non-Latin writing script. The subject of stamp valuation is a deceptively complex one. While at first glance, determining the value of a stamp might appear to be a simple matter of turning to one of the many available reference catalogues, in fact the stamp catalogue is just the beginning of the process. This overview presents some of the major topics in stamp valuation, setting you on course to making confident purchases and understanding the ultimate worth of your collection.